Make Your Ntebook Mor Comfortable and Ergonomic as Desk-Top PC. This adjustable notebook stand raises your laptop computer up to a comfortable height so you can use it like a desktop PC. 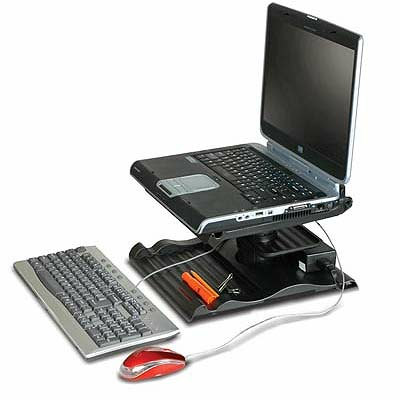 With the addition of a keyboard and mouse (available separately) your laptop becomes a home or office workstation. There's plenty of storage space underneath and built in cable management in the base.